near the end of the project don't all of a sudden rush it to a finish. Take your time at this point, especially with the shaping of the stock. When finishing the metal or wood, sand and polish the surfaces level and very smooth. We want you to be proud of the finished product. If the rifle proves to be what you expected and we are confident it will, we want you to do one more thing, and that is to stamp the gun to identify it. Put your name and address, along with the year and caliber, on the left side of the barrel. Follow by stamping the receiver to identify it: on the No. 1 VAULT LOCK stamp: FM No. 1 VAULT LOCK. On the No. 2 VAULT LOCK STAMP: FM No. 2 VAULT LOCK. On the CHICOPEE R.F. stamp: F.D.H. CHICOPEE R.F., and on the centerfire stamp: F.D.H. CHICOPEE C.F. Enough of the VAULT LOCK and CHICOPEE actioned rifles have been made by us and others using these plans to make us confident that the designs are sound and the plans complete. However, since we have no control as to the materials you use in making these actions and rifles, or in the care in which they are constructed or in the way the guns may be handled, we cannot assume any responsibility or liability for any accident that might be incurred in the making of these guns, in the handling of them or in their use. If a firearm is handled or used carelessly or thoughtlessly it can become a dangerous weapon. Always remember to handle a gun as though it is loaded. Don't keep live ammunition lying around on your workbench, and never use a live round to check headspace or anything else. Always stamp the rifle for the correct caliber designation that it is chambered for and use only that ammunition in it. If a cartridge does not chamber easily and fully with finger pressure, then do not force it into the chamber by closing the breech block on it. Doing this will inevitably lead to trouble. Before firing a rifle make sure that both the chamber and bore are free of grease and oil. All of our rifles have positive safeties but the best SAFE is an unloaded gun. An open actioned gun can't be fired, but more important is that it will let your companions know that it cannot be fired. When target shooting or hunting small game or varmints with one of our rifles there is no excuse for carrying the rifle loaded or unloaded with the action closed. Gun accidents are seldom accidents, they generally come about because of careless or thoughtless gun handling and use. A fine FM No. 1 VAULT LOCK rifle in .223 caliber which was made from the plans and instructions outlined in this chapter. It has a 27" tapered, octagonal barrel on which is mounted a Weaver 3x9X Marksman scope in Redfield Jr. mounts. Although the action is odd and unusual this rifle is altogether very shootable, having been fired a great many times. The VAULT LOCK action is unique in that it has a cylindrical breech block, side loading/ejection port and a breech block which is solidly supported above and below the chamber. It also features a horizontally swinging hammer, an automatic SAFE, fully adjustable trigger, extractor suitable for either rimmed or rimless cartridges and throughbolt stock fastening. It is opened and closed by the finger lever which encircles the front end of the trigger guard. We will readily agree with anyone who describes our FM No. 1 VAULT LOCK rifle and action (Fig. 2-A) as the most unusual and unique single-shot rifle action to be seen in these modern, high technology times. One look at it and we think you will also agree that it is * 'something else", to use a modern cliche. We make no claims to be the originators of any of its many different and unusual features, as it is more than likely that all of them have been used and perhaps patented many years ago by inventors of single-shot rifle mechanisms. These features might include those visible at a glance from the outside of the action such as the vertical rising and falling cyclindrical breech block which is supported at its top as well as below, a side loading port, a horizontally swinging hammer and a plunger which serves both as a sear and safety and inside the action, a ball and socket linkage between the finger lever and the breech block. However, we like to think that we were the first to refine these features and put them all together into a compact, strong, safe and shootable breech loading action; one which an amateur gunsmith, knowledgeable about firearm mechanisms and skilled in metal working, can make in his or her home workshop. We have proof that this last statement can be done as we have seen rifles and photos of rifles which were built by amateur gunmakers using our original plans much less detailed than the ones in this chapter. The FM No. 1 VAULT LOCK action is a true falling block. It is operated by an under finger lever to open and close the breech (Figs. 2-B, 2-C, & 2-D). Its cylindrical breech block is solidly supported in the receiver by two rings of steel above and below the breech. It is loaded from the side rather than through an opening on top and this feature allows the scope to be mounted very low over the receiver. 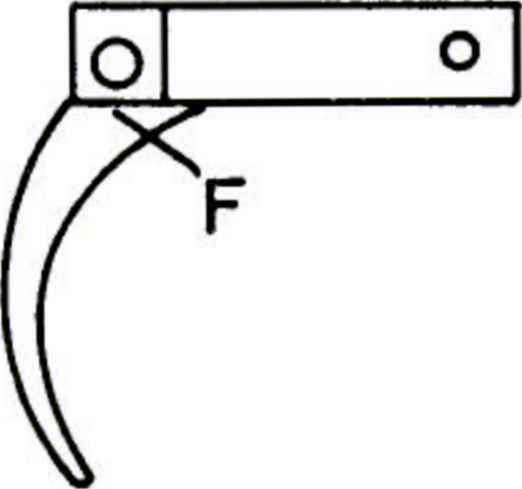 The horizontally swinging hammer is built into the side of the receiver and it has to be manually cocked (Figs. 2-E & 2-F) to fire the rifle. A heavy plunger, which serves both as a sear to hold the hammer cocked and to release it and as a safety to prevent the rifle from being fired, is conveniently placed and positive in its function. The hammer must be cocked before the action can be opened and loaded, and on being cocked it is automatically placed on SAFE. When cocked the hammer cannot be lowered or otherwise released unless the action is closed. 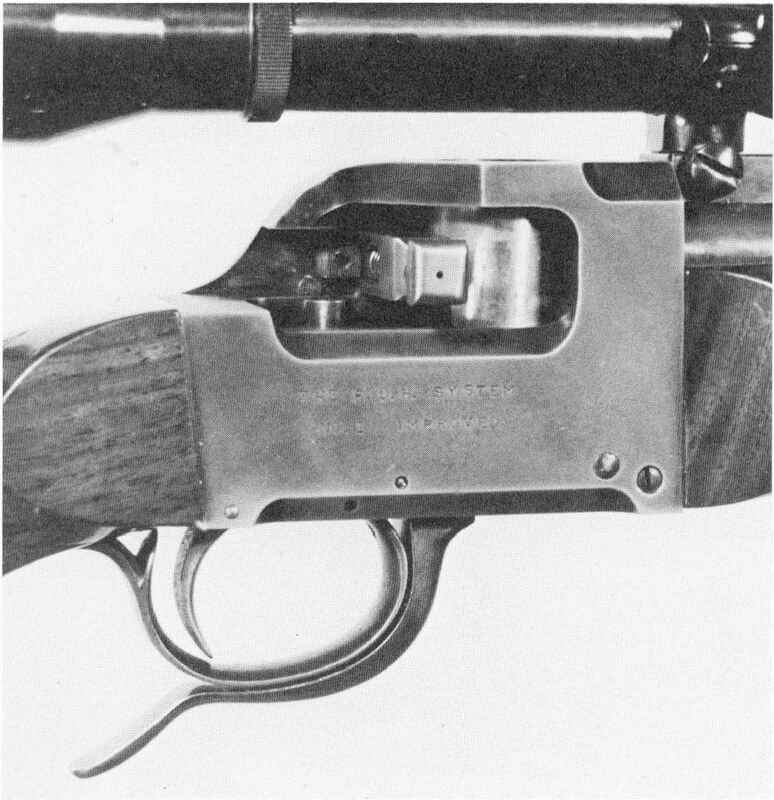 When the action is closed, to fire the rifle the sear/safety plunger is pushed down until it is stopped by the sear lever, after which, when the trigger is pulled to trip the sear lever, the hammer can fall. The trigger is fully adjustable. The extractor is activated automatically when the action is opened and it is adaptable for both rimmed and rimless cartridges. Coil springs are used throughout. The left side of the FM No. 1 VAULT LOCK action. The upper two screws hold the hammer in place and the small oblong part is the sear/safety hold-down plunger. The lower screw is the sear/safety retainer screw. Two other photos of this rifle and action (Figs. 1-1 and 1-2) can be seen in Chapter 1. 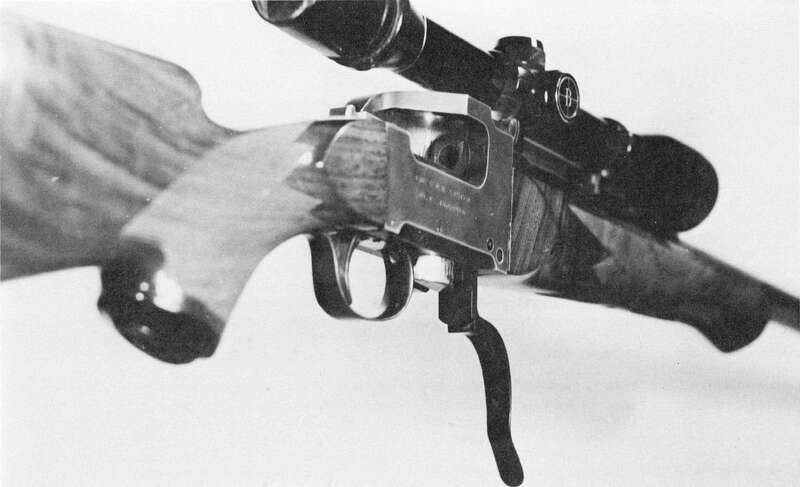 A close-up of the opened action of the rifle in Fig. 2-A. The name VAULT LOCK was chosen for this action as it describes the appearance and movement of the breech block since it is not unlike a cylindrical locking bolt in an ordinary bank vault door. The hammer must be manually cocked before the action can be opened and on being cocked it is automatically put on SAFE, and in addition, locked there so that it cannot be released while the action is open. How to make a vault locking mackinism? What is a vaultlock rifle?